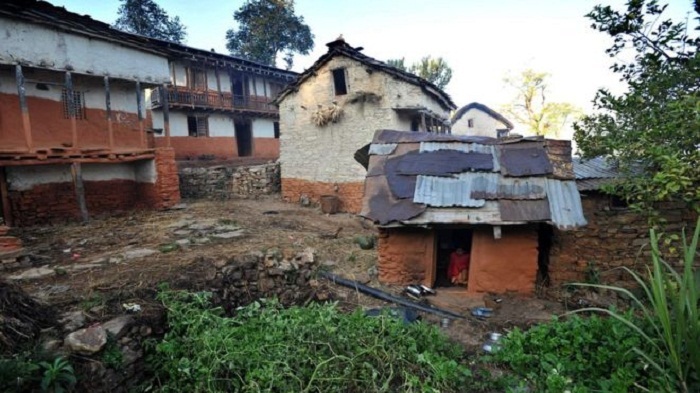 A Nepali mother and her two children have been found dead after the woman was banished to a "menstruation hut". The woman had lit a fire to keep her and her two young sons warm in bitter winter temperatures. All three are suspected to have died in their sleep due to smoke inhalation, officials told BBC Nepali. The traditional practice of exiling menstruating women from the family home is banned in Nepal but it is still widely practised in rural areas. This case is not the first tragedy to have occurred when women have been sent to sleep in the huts - a practice, known as chhaupadi that was criminalised in 2017. There have been several cases of suffocation and at least one teenage girl has died after being bitten by a snake. Under the ancient practice, linked to Hinduism, women who have their periods or who have just given birth are seen as impure or as bringers of bad luck, and can be forced to sleep in huts or cattle sheds. They are banned from touching cattle and men, denied access to some foods and can be barred from toilet and washing facilities in the house, forcing them to walk long distances from their villages. They can also be exposed to extreme cold in the winter and criminal attacks, and young women cannot go to school. The latest tragedy occurred in far-western Nepal's Bajura district. District chief administrator Chetaraj Baral said an autopsy has been carried out but authorities are yet to receive confirmation of the cause of the deaths. Blankets in the hut were partially burned and the mother was found with burns to her legs, police told AFP news agency. The children were aged 12 and nine. 'The bodies have been handed over to the family for their last rites,' he said. Under Nepali law, anyone who makes a woman observe chhaupadi faces a three-month jail sentence and a $27 (£21) fine. Activists have called for the law to be more stringently enforced.